#MoviesMusicPlaysFilmFestivalsConcerts: News: Olivier Assayas' "Clouds of Sils Maria" opens in Los Angeles on April 10! News: Olivier Assayas' "Clouds of Sils Maria" opens in Los Angeles on April 10! 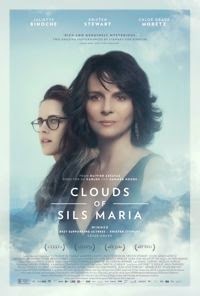 Award-winning film "Clouds of Sils Maria" will finally open in US theaters on April 10, 2015, nearly a year after its sensational debut at last year's Cannes Film Festival and more than a month after one of its stars, Kristen Stewart, made history by winning as the year's Best Supporting Actress at the Cesars, France's top acting awards! The movie is a modern-day update of the classic "All About Eve" and tells the story of Maria Enders (Juliette Binoche), who, at the peak of her international career, is asked to perform in a revival of the play that made her famous twenty years ago. But back then she played the role of Sigrid, an alluring young girl who disarms and eventually drives her boss Helena to suicide. Now she is being asked to step into the other role, that of the older Helena. She departs with her assistant (Kristen Stewart) to rehearse in Sils Maria; a remote region of the Alps. A young Hollywood starlet with a penchant for scandal (Chloë Grace Moretz) is to take on the role of Sigrid, and Maria finds herself on the other side of the mirror, face to face with an ambiguously charming woman who is, in essence, an unsettling reflection of herself. The film is written and directed by one of the world's leading filmmakers, Olivier Assayas, and produced by Charles Gillibert. If you can't wait for April 10, a special screening of the movie will be held at the USC campus on April 1 and it's going to be free!! !